I eat tacos with investors. That’s right. A few times a year a group of real estate friends get together to talk shop at the best taco joint in town. It’s informal and fun because we’re friends, but it’s also valuable to get a sense for what everyone is seeing out there in the trenches. Anyway, despite not having tacos in front of me at the moment, I wanted to share some of the things that have seemed to come up lately in housing market conversations. Anything to add? 1) One high or low sale doesn’t make or break a market. 2) Just because inventory is low doesn’t mean buyers will pay any price. 3) The market isn’t doing the same thing in every neighborhood or price range. 4) There is no such thing as a national housing market. The “national” market is actually made up of thousands of local markets (Jonathan Miller). 5) Appraisers only measure the market. They don’t make values go up or down. 6) There is no recipe or formula for the way a housing “bubble” has to pop. In other words, for all the conversation about a current “bubble”, if the market did “pop” it wouldn’t necessarily have to look the same way it did 10 years ago. 7) Real estate advice has a shelf life, which means it might not be good for every market (or every price range or location). 8) Markets aren’t so perfect that we can say a property is only worth one certain amount like $336,456. It’s best to recognize there is a reasonable range for what the market might be willing to pay (say $330,000 to $340,000). Is there any support for the appraised value to come in at or near the list price or contract price? Does this price fall within the range of what is reasonable? 9) “Negative market trends are not the end of the world. They represent opportunities for some” (from Jonathan Miller). 10) Thinking positively or talking positively about the market doesn’t drive the market. In other words, “you can’t overpower the market with the power of positive thinking. The market doesn’t care what you or your client thinks” Jonathan Miller. You may notice I referenced New York Appraiser Jonathan Miller a few times above. I realize that makes me look like a fanboy, but that’s okay because he’s an influential voice in my life and I appreciate his weekly notes every Friday. Last week Jonathan knocked it out of the park in his section entitled “McMansions, McEgos, McPrices and McHonor” (that’s where I picked up point #9 and #10). 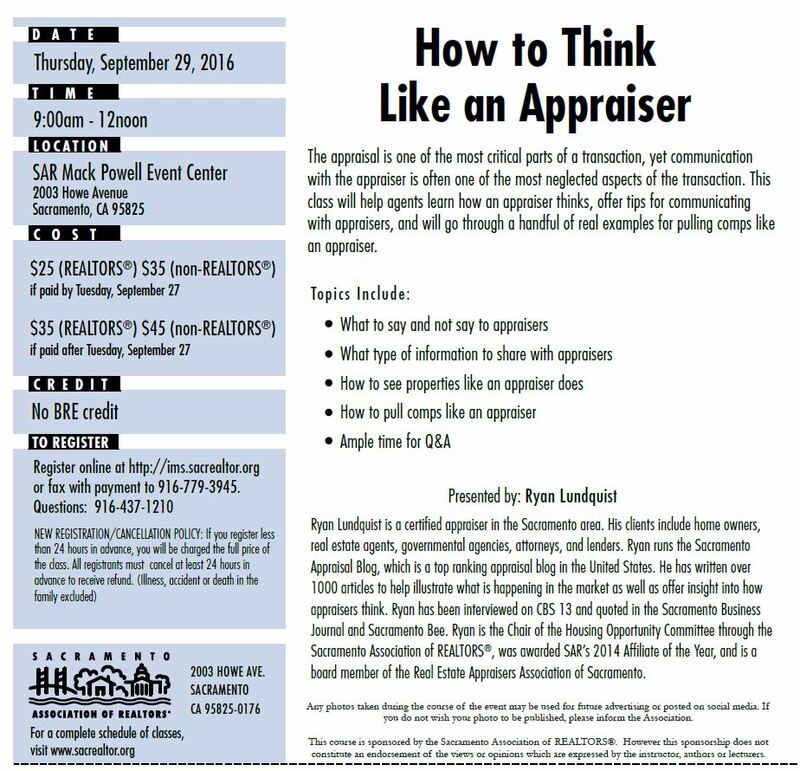 Class I’m teaching on Thursday: On September 29 from 9am-12pm I’m doing my favorite class at SAR called HOW TO THINK LIKE AN APPRAISER. We’re going to have a blast talking through seeing properties like an appraiser does. We’ll look at comp selection and talk through so many issues. My goal is to help you walk away full of actionable ideas. Register here. Questions: What types of conversations are coming up in your circles right now? What is #11? I’d love to hear your take.